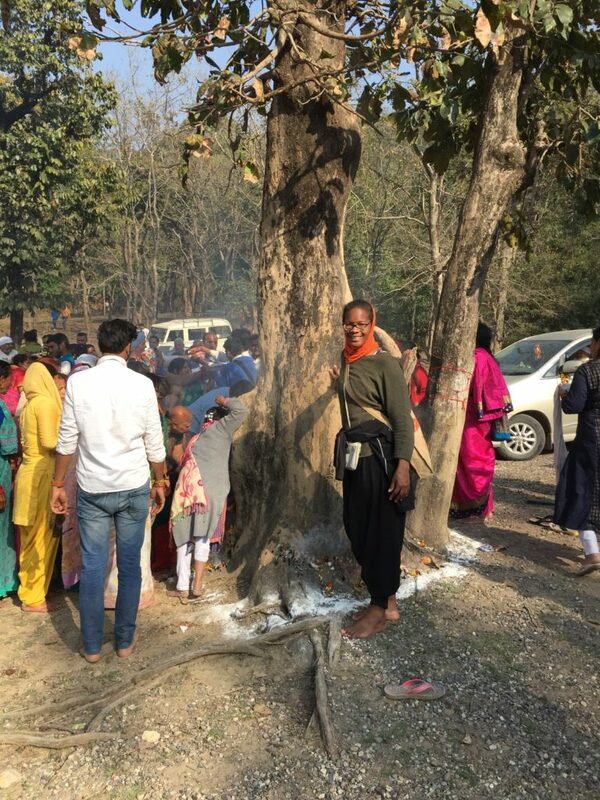 This year I joined my friend, Kamal, and his mother for the annual Manikut Yatra Parikrama, during which pilgrims from the holy city, Rishikesh, circumambulate sacred places around the Manikut Mountain range surrounding the world capital of yoga, a 62-km pilgrimage held the week before Holi Festival (Feb/March). This was both Kamal’s and my first time doing the pilgrimage. Over the course of the day-long taxi pilgrimage, I learned that hundreds of years ago, pilgrims from all over Rishikesh would gather in Laxman Jhula to begin the trek in the earliest hours of the morning to worship at 12 different gates (darwas), honoring various gods of Hindu worship, including Hanuman, Lord Vishnu, Garud, Guru Jupiter, 64 Yogini, Mata Kali, Bal Kunwari Mata, Mata Bhubaneshwari and their collaborative manifestations, Mata Kushmanda, Mata Vidhayvasini, Lord Shiva’s Gan Nandi, Virbhadra Mahadev, Lord Ganesha, the chief Ganesha of Shiva. 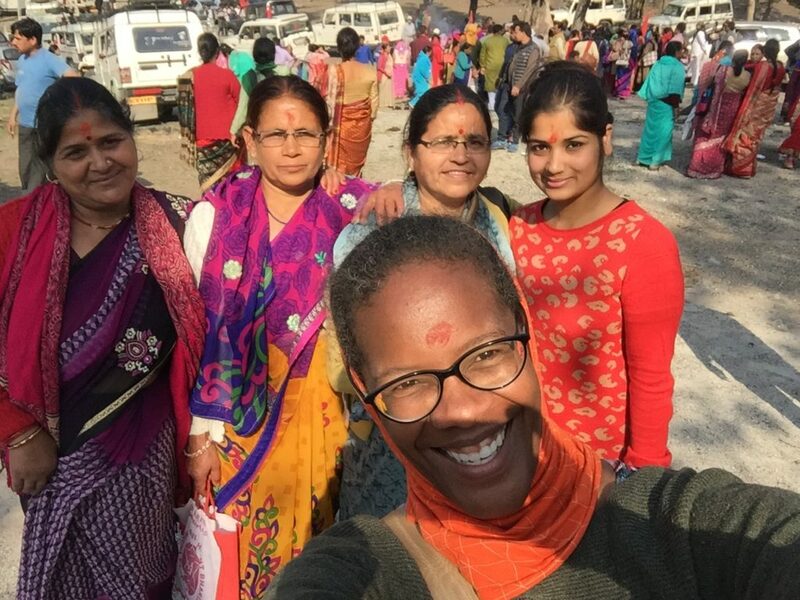 Some on the journey recounted that the pilgrimage honored the Hindu goddess Durga, protective mother of the universe. Others shared that it was to worship Shiva, the most widely known and revered god, who is often worshipped as one member of the Holy Trinity of Hinduism (along with other deities Brahma (the Creator) and Vishnu (the Protector)). The time-honored tradition of the Manikut Yatra Parikrama had been observed on foot by residents of Rishikesh until 2014. Kamal’s mother had taken the journey several times over the years. Sometimes on foot, other times by taxi. Inspired to make the mountain ranges more accessible, the Manikut Parikrama Committee collaborated with the Public Works department to connect roads that had been impassable prior to 2014, creating the space for the local taxi driver’s union and businessmen in the area to sponsor the event and provide transportation to many hard-to-reach gates beginning in 2015. 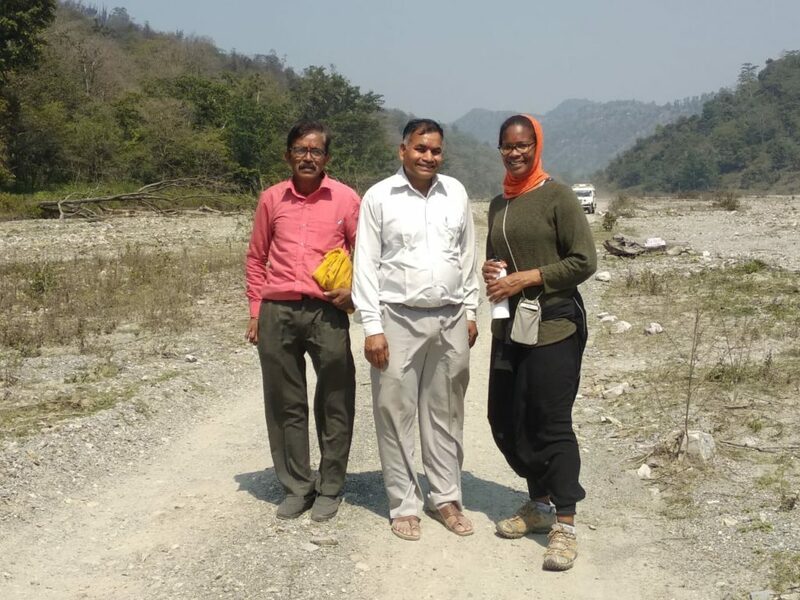 Free taxi services are provided for Rishikesh locals to give the elderly access to terrain that is largely impassable by foot, and foreign tourists eager to participate in the annual pilgrimage can hire a local taxi for the journey. After arriving at Kamal’s home early the next morning, we gathered at the corner of on Laxman Jhula Road and Swaragashram Trust Road to meet up with the driver. 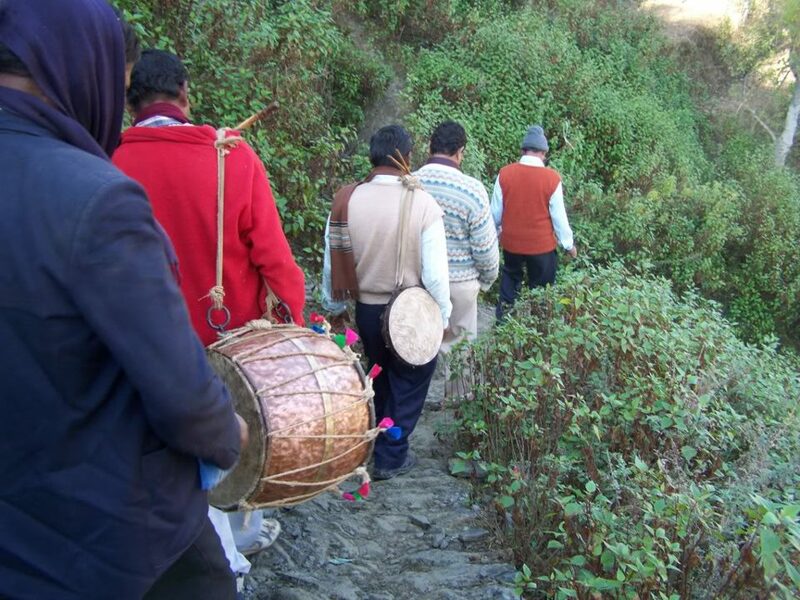 Pilgrims who began the journey on foot at 4:00 AM traveled in the traditional manner, carrying instruments native to Uttarakhand, such as drums (dhol, damama, hurka), bagpipes and flutes (muruli). The pilgrimage (yatra) route was flagged off for worshippers so the procession could make their way along busy roads unimpeded by traffic, and so pilgrims knew the route to take. By foot, the journey typically takes two days, passing through remote regions of the mountains, with very few to no places to stay overnight. Devotees in the past would spend the night sleeping among the rocks under the stars. Since the construction of safer and wider roads, the cliffs became passable and mythological places became more accessible. 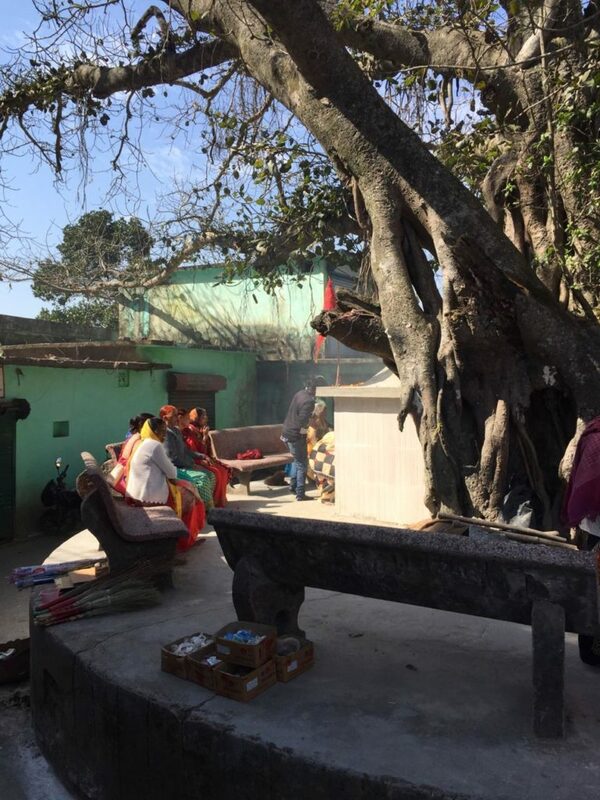 Now the route enables locals to have a heightened awareness of these spiritual sites. The Manikut Parikrama Committee, dedicated to preserve these spiritual sites of worship, entreated the State Government in 2015 to proclaim Manikut Mountain a pilgrimage area to be preserved as a pilgrimage region. Talks are underway to consider doing so. Hundreds of devotees, local and foreign, have participated in the Manikut Himalaya Parikrama Committee in the past according to instruction from their teachers (Guru). 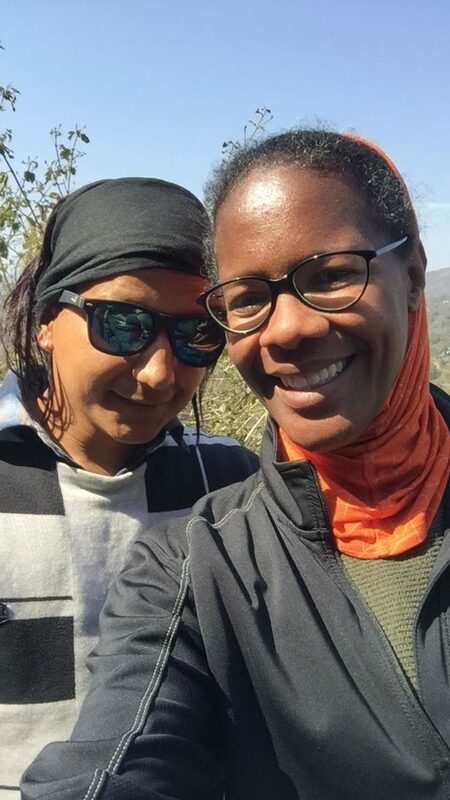 I accompanied Kamal, his mother and several of her friends by taxi, which allowed us to make the trek within one day. 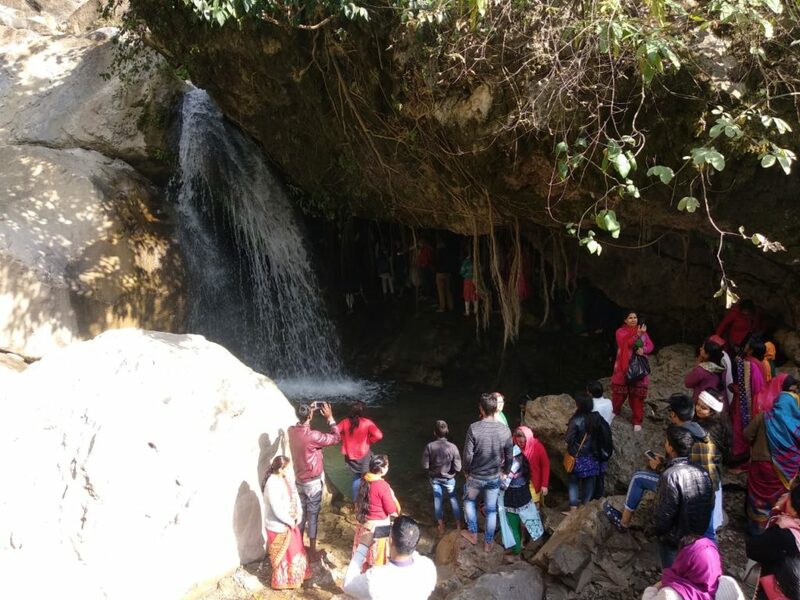 Although the Manikut Yatra Parikrama begins at the first gate, the Pandav cave (pandakuwa), in Laxman Jula, we began the journey at 8:00 AM, joining a caravan of other taxis, and met at the fourth gate, the Kalikunda Waterfalls. There, I saw five Gurus explaining to their devotees that the journey of Parikrama (circumambulation) began hundreds of years ago to awaken the master element, world welfare, the unity of the country and the upliftment of mankind. My visit to the waterfalls at the fourth gate was one of the highlights of my journey. I had passed by this site, nestled off the eastern side of the road leading to Patna Waterfalls, on scooters for the last three years and never knew the waterfall was there. It’s a beautiful, tranquil waterfall that blankets a shallow cave whose temperatures are cool in the summer months owing to the shower of the waterfall. Clothed pilgrims walked behind the curtain of the waterfall and emerged completely dry. It occurred to me that this would be an ideal refuge for saints and sadhus of times passed to meditate. The sun was continuing its climb toward its apex when we arrived at the fifth gate, the Duelly Banyan Tree. Thirteen passengers disembarked from the taxi, all faces smiling and enjoying the companionship of the other pilgrims on this journey. An astute reverence preceded the chanting and offerings made at each of the gates that was immediately followed by a camaraderie that embraced us during this shared experience. We stopped along the way to snap photos and take selfies. We left the fifth gate in search of the taxi. After a short wait, the driver returned with three additional passengers. Among them, his wife and mother-in-law. There were eight men and six women in the taxi before the wife and mother-in-law. The re-organized themselves — Kamal and two of them climbing onto the roof of the jeep, as the taxi only fit 14. We resumed our journey, and 45 minutes later arrived at the sixth gate, Kamal’s mother and her friends chanting the whole way. 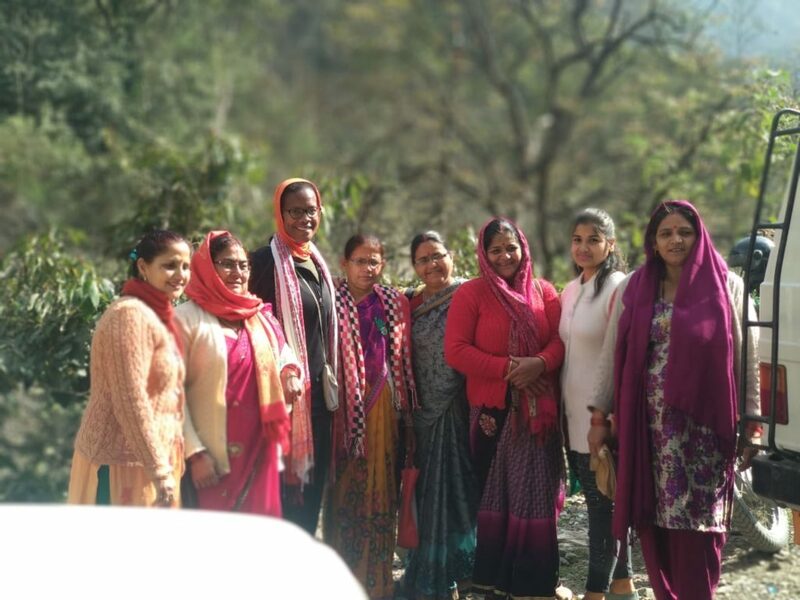 I met new friends at the sixth gate (Diwali), who took me under their wing and shared the stories of their journeys along the Manikut Yatra Parikrama. Among them, owner of Daily Needs at Triveni Ghat in Ram Jhula who has been making this pilgrimage for the last 11 years. 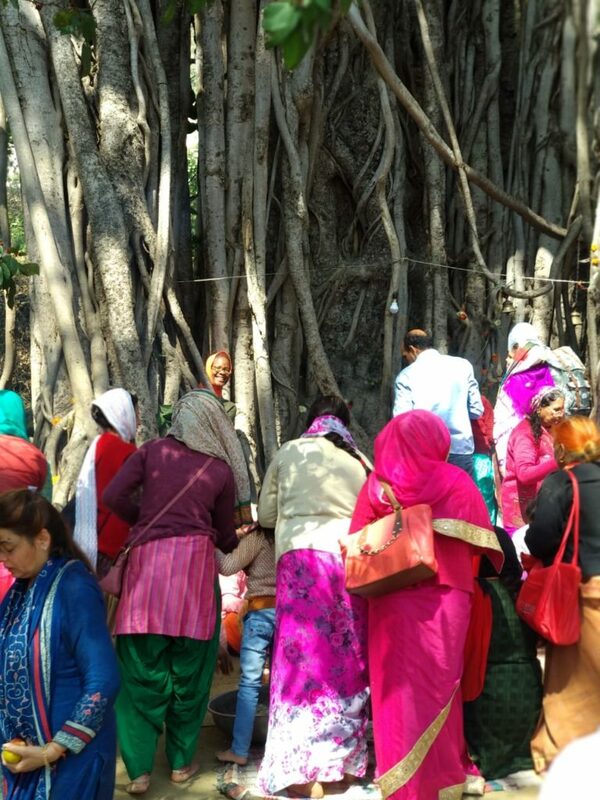 We circumambulated the Taido Banyan Tree at Diwali and shared prasad (lunch blessed by the deities) underneath her branches. 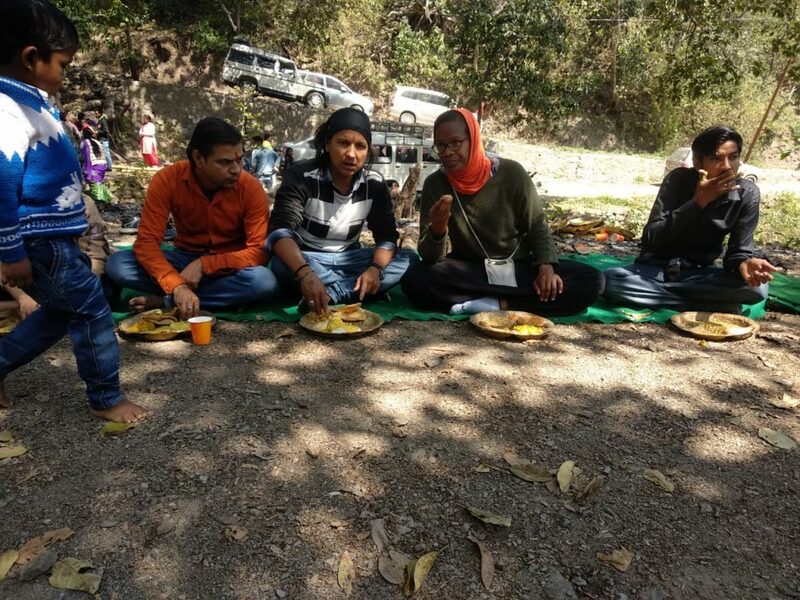 I also struck up a conversation with Ram Bhabu, from Pune, who has been making the journey to Rishikesh for the last three years to participate in the annual Manikut Yatra Parikrama. It was here that the four of us, the Daily Needs owner, Ram Bhabu, Kamal and I, decided to trek, separating from our taxi pilgrims. The new passengers from the fifth gate sat comfortably inside the taxi, thanks to our willingness to surrender our seats. 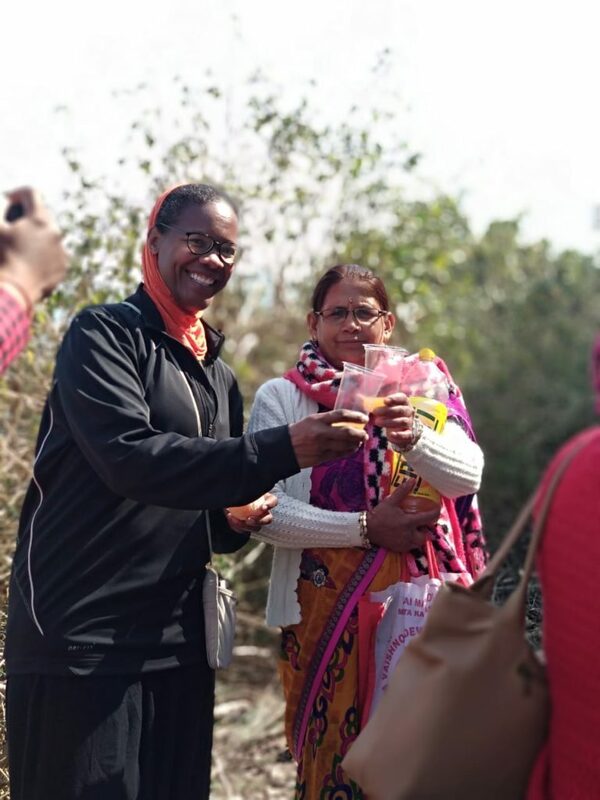 We set out across the expansive, predominantly dry Ganga bed, which was dotted with rivers and streams, in honor of Durga. Vehicles crowded with pilgrims kicked up dust as they passed us along the dry river bed. Yet, we were lost in the stories of our newfound friends’ journeys, and barely noticed the passing vehicles except for the occasional, “Side!” yelled out by one of the pilgrims to alert the rest of us of an oncoming vehicle. The time flew by. Before long, we arrived at the seventh gate, Bindabasini Waterfall, where we re-joined the taxi pilgrims. The 10-seater taxi was crammed to over flowing with 17 with passengers. So Kama and I, and two local boys, climbed on top of the jeep and rode the next 12 km, passing the next three gates. The terrain was mild and flat. In sharp contrast to the terrain leading to the sixth gate. I felt much more at ease not only with Kamal sitting on the roof, but also sitting by his side. The ride atop the jeep was another memorable highlight of the pilgrimage. It reminded me of my years growing up in Chaparral, New Mexico. And the route was so scenic, we all agreed it felt like we were on safari. Pure magic. We arrived just before the eleventh gate, Ganesh Chowk, to a traffic jam that stopped the caravan in its tracks. Kamal and I dismounted the jeep and traded transportation with two friends of our roof-top traveling companions. We rode their scooter so they could complete the pilgrimage with their friends on top of the jeep. Among the local pilgrims could be seen a large number of foreign devotees, accompanying their gurus on this legendary journey. The journey came to a close Sunday evening, with worship at the twelfth gate, Nilkanth Marg, the Bhairav valley gate. Guruji led a pooja ceremony and the pilgrims concluded the journey with Vedic chants and the hail of Har-Har Mahadev and Bam-Bam Bhole. 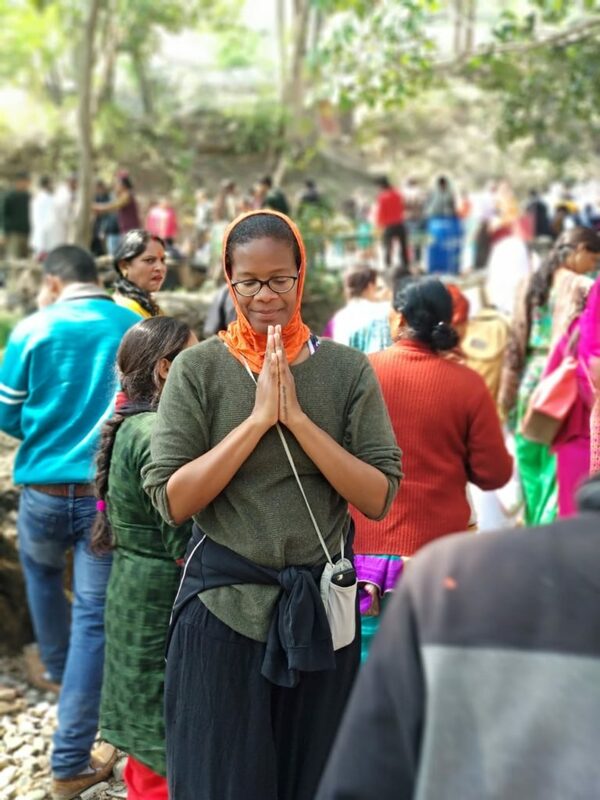 We left the twelfth gate and returned to the taxi stand outside of Ram Jhula, east of Parmath Niketan and awaited all the pilgrims from the caravan. Hundreds climbed out of the taxis and walked in a procession singing and chanting, to Laxman Jhula, where it all began. 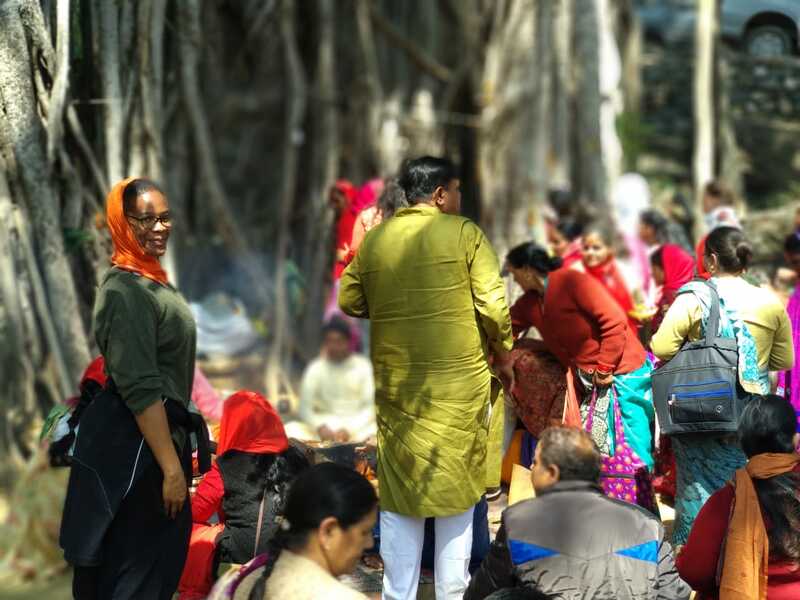 Filled with the love of devotion and surrounded by the glowing faces lit up by the days worship and celebration, I separated from the group when we arrived nearby my guest house. The pilgrimage left me inspired and eager to join next years festivities.